BenchmarkPortal’s Call Center Certification, (http://www.benchmarkportal.com/call-center-certification), helps your company attain world-class call center performance. 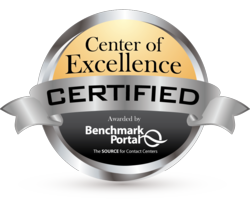 BenchmarkPortal is expanding its Center of Excellence (COE) program, to offer Certification to Call Center Outsourcers, (http://www.benchmarkportal.com/call-center-certification/call-center-outsourcer-certification). Having your operations certified as a Center of Excellence shows your commitment to high standards and your interest in leading-edge best practices. BenchmarkPortal’s proprietary “balanced scorecard” methodology focuses on metrics relating to quality, on one side, and to cost, on the other. The statistics are determined through continuous processing of thousands of performance metrics stored in our data warehouse of thousands of call centers, which is the largest of its kind in the world. Those centers with superior performance on both sides of the equation become certified. The statistics are determined through continuous processing of thousands of performance metrics, from thousands of call centers, which are stored in our data warehouse, the largest of its kind in the world. Call center managers seeking outsource partners to handle their calls want assurance that these calls will be handled efficiently and effectively. BenchmarkPortal can help outsourcers prove that their operations are both efficient and effective according to objective, industry-based standards. With its database of call center metrics (the largest in the world) and its 17 years of experience in benchmarking and certifying hundreds of Global 500 call centers worldwide, BenchmarkPortal, through its certification process, validates outsourcer services. The outsourcer certification can help outsourcers with their marketing efforts, client satisfaction metrics and bottom lines. Since companies spend vast amounts of money implementing and operating call centers to ensure a competitive edge in customer service, it has become mandatory that the call handling process be conducted at best practice standards. This need to function at best practice levels has created the need for third-party certification that call centers are operating at this high level of call handling performance. BenchmarkPortal’s rigorous certification process has the advantage of referencing all performance goals to its best practices database of thousands of call centers. Call center managers will be held to performance levels that will improve their company’s competitive position. "The certification process is well worth the time and effort. Our management staff learned a great deal through the process and are putting those lessons learned into everyday practice. Our call center staff was energized by earning the Center of Excellence Certification. We all take a great deal of pride in this accomplishment and are eager to keep improving our customer service experiences." Click here to learn more about our Call Center Certification programs.